Whew, that was a long blog break. Beth and I had a blast on our big trip. I drove 1500+ miles over 4 days and we both shopped till we literally dropped. Now that's behind us and it's time to look forward. That makes decent photos hard to get, sorry. This is the third floor landing. My studio actually begins out here. The binders store all the pictures that I cut out of magazines. The picnic baskets are full of trims. These are all my crafting books too. I know. More is more, obviously. Behind one door is a big walk in closet. Full of more stuff of course. Behind the door on the left is my ironing station. You'll see. 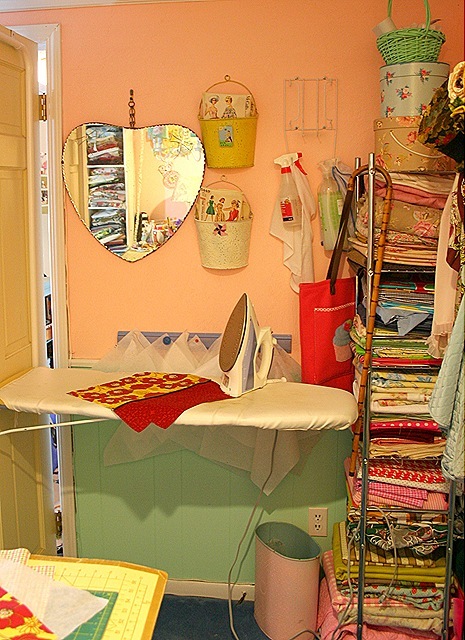 My fold down ironing board is a wonderful thing. 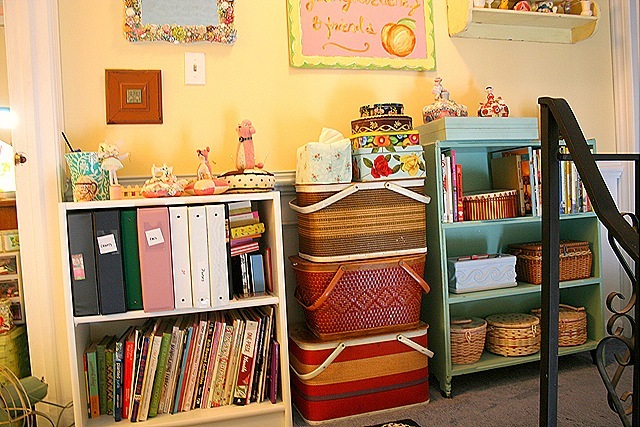 Pretty containers make organization more fun. And no, I don't floss my teeth while I am sewing. Floss is great for making gathers. 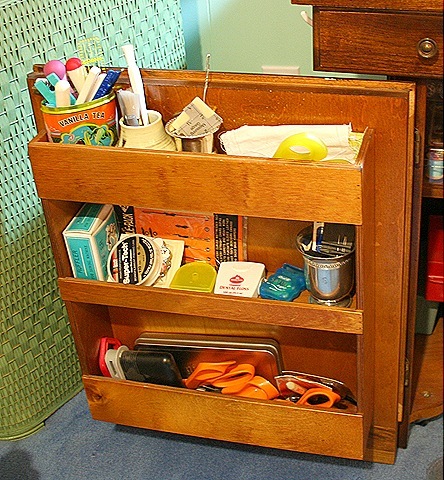 Every container and drawer is full of something. I collect vintage sewing stuff. Shocking I know. 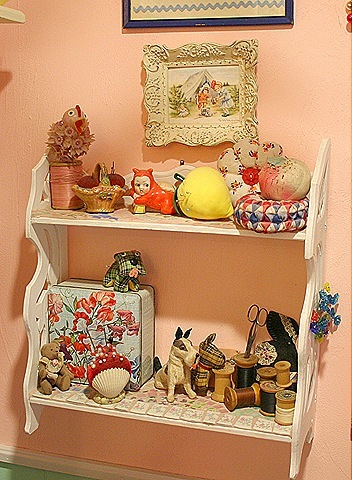 Just a shelf full of cuteness. 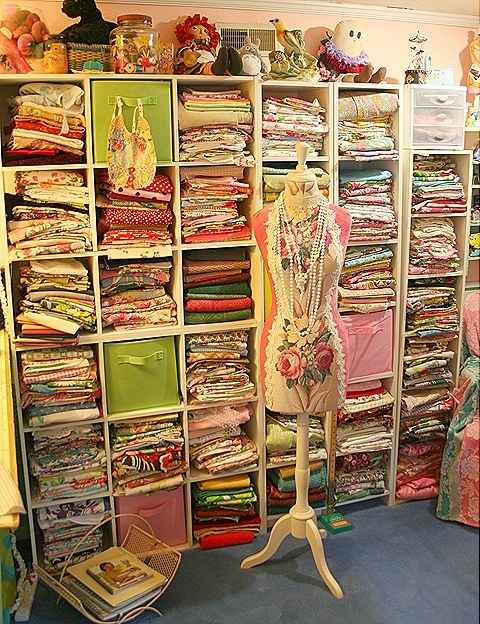 OK, this is only part of the insanity that is my fabric collection. Bare wall space is not an option. 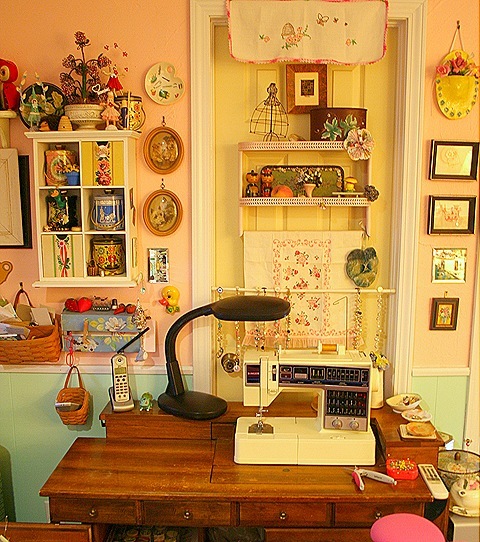 Command central, the sewing machine. Can I tell you I am jealous. 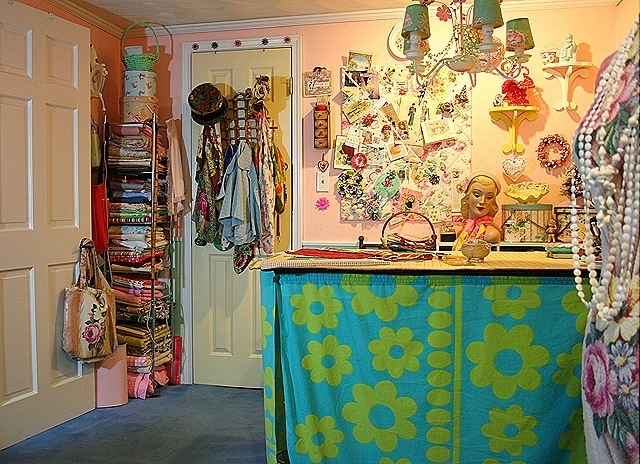 I would love to have my own space to do my scrapbooking! Oh, my heart went pitter-patter when I saw those glorious vintage tins. Love them! Had to go thru the photos twice to take it all in…love it…I am in the same camp as you with the more is more. Great old puppet spinner – fun that you know where it came from too. I love your space! You inspire me to put up all the things I love and enjoy them. No rules, only freedom. Oh my goodness, gracious. That was an amazing tour. 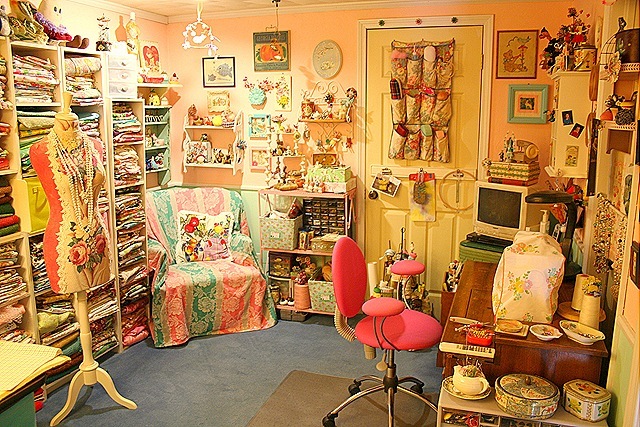 I love the ribbon spinner too, and the fabric stash and the stuffed animals and the ironing station, picnic baskets, sewing machine area, etc.,etc.,etc. Are you sure you want to move it? It looks just perfect as it is. That is amazing! Really, are you sure you want to move it? It looks spectacular! When my oldest daughter finished her second year of college, her sister took over her room and her brother took over her room…now that middle daughter is going into her junior year, and our youngest is in his first year and staying closer to home, all of the bedrooms are being restructured again. It is all pretty exhausting! Littlest Peach must be pretty excited! Oh My God Suzy, I thought I’d died and gone to Crafting Heaven. 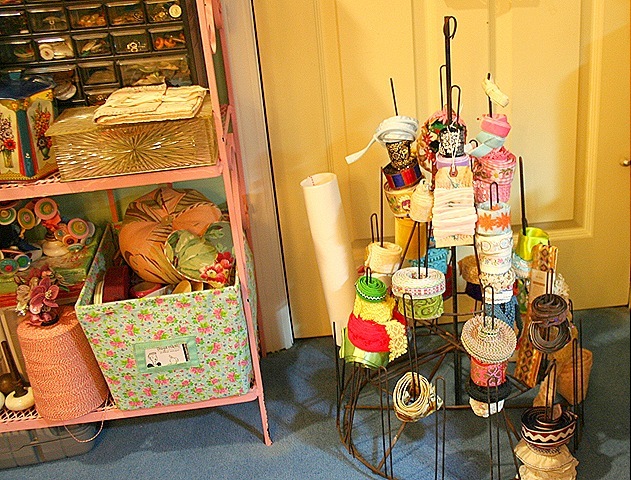 You have SO MANY gorgeous supplies and treasures in your studio. Love it all. Really love the heart mirror too. WOW! You could be in Were Woman Create. 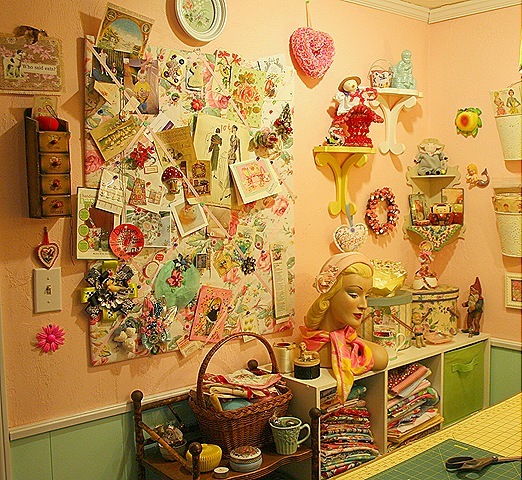 This is a very cool craft/hobby room. So organized and pretty. I don’t envy you the move, but can’t wait to see how you do it. 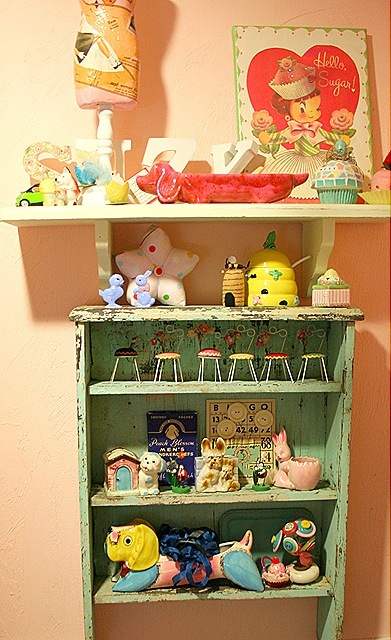 The shelf of cuteness! 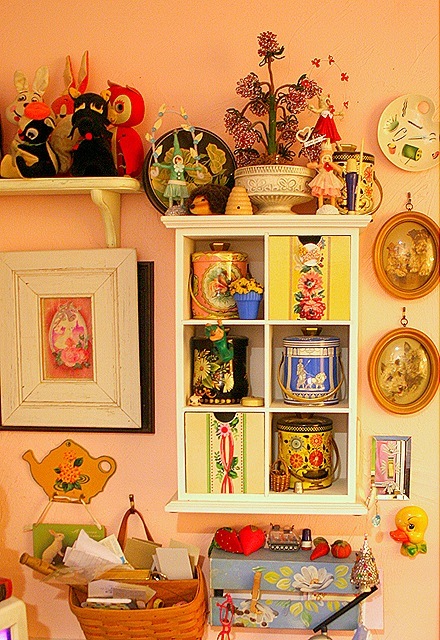 I saw so many things that just made me smile – what a happy room you work in. Thanks for the tour! Amazing! But it looks fabulous as it is–maybe you could get a skylight installed instead of moving it! What a feast sfor the eyes!!! I would love to take ever single piece of fabric out and look at it!!!! I promise to fold it back up and put it back! Hmmmm….how does the saying go…the one with the most fabric wins! I met a lady in the military and her husband told her she was not moving her fabric again…..so she wrapped her china with it! WOW. 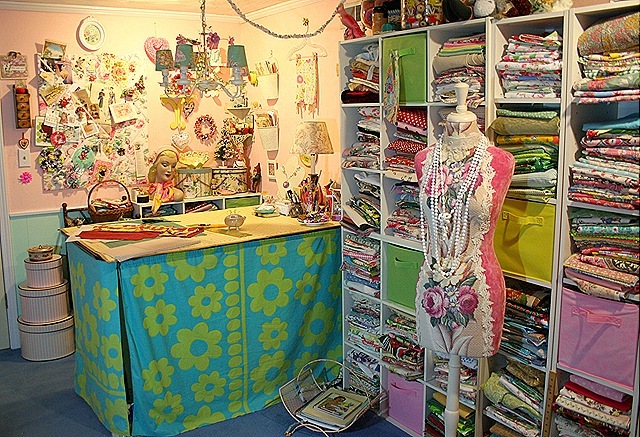 I am *dying* after looking that vintage sewing/fabric goodness!!! I wish you could see the expression on my face (ok, maybe not). I collect vintage sewing stuff too. Of course. And more is always more. At least until you have to move it. Hopefully you’ll have more room for more ‘more’. Wow! Such beautiful abundance. Love it. Wow, how awesome! I can’t wait to see your progress! Your space is very inspiring! Oooooh!!! You are WAY TOOOO MOTIVATED in this endeavor!! I’m sure your new space will be splendid though! GOOD LUCK! Wow, your new space must really be worth it to inspire you to move allll of your lovely treasures. Lovely collections, now you’ll have a chance to “play” with them again. This is seriously one of the most beautiful studios I’ve ever seen! I write a column for Examiner.com and am planning a future article on creative spaces. I’d love to feature your studio (as is or after the big move.) Please let me know if you are interested! Gorgeous. i’d love to just visit and look at everything! Oh my goodness! The green eyed monster has just jumped onto my back! What wonderful fabulous studio – window or not! Love the heart shaped mirror looks quite an old one judging from the clips and chain. I would never get any work done in there, I would be too busy admiring the surroundings! What a wonderful happy space! I had to look at each pic. for awhile just to take in all of the great things that you have. Wowzer!! Man did I enjoy that tour. I loved looking at everything!!! You have a wonderful area to create. So happy looking. Thanks for the great tour Suzy. You and your space should be in Where Women Create…I want to go to there! Really??? Everyone is saying how fabulous this room is??? I find it exhausting to look at and think about keeping organized and clean. YIPES!